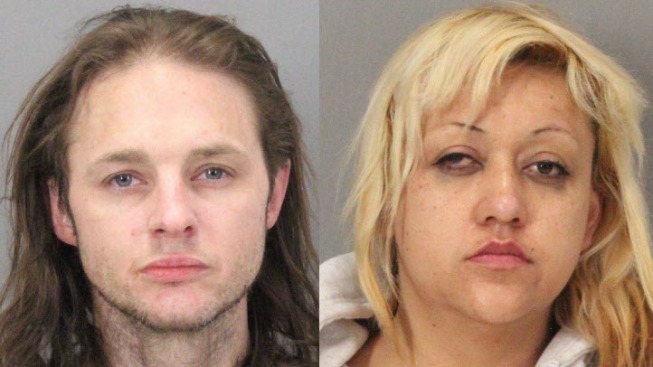 Police hope a Mountain View city street will be safer since the arrest Tuesday of two residents who were allegedly selling drugs from a home there, police said. Samuel Rowles, 39 and Elideth Rodriguez, 33, were arrested at about 8 p.m. at their home in the 700 block of Hope Street. The home is less than two blocks from First 5 Santa Clara County, a nonprofit that serves children and families. When officers served a search warrant at the home they allegedly found guns, ammunition, methamphetamine, drug paraphernalia and an ATM machine that had been pried open. Police obtained a search warrant because they believed Rowles and Rodriguez were stockpiling guns at the home. Officers allegedly found a pistol, magazine rounds and multiple calibers of ammunition. Police spokeswoman Katie Nelson said Rowles and Rodriguez are convicted felons and it's illegal for felons to have guns. Rowles and Rodriguez were taken to the county jail on suspicion of possessing a gun as felons, possessing ammunition, maintaining a drug house, possessing methamphetamine and possessing drug paraphernalia, according to police.